‘How To’ Conquer Holiday Eating Challenges! This article offers a variety of how to tools to conquer your holiday eating challenges. It is sometimes difficult to resist the pressure to eat these “special” dishes so no family member will be offended. It is at these holiday times that old tastes and preferences surface along with a compelling need to feel emotionally satisfied with these nurturing family traditions – whether they are healthy or not. Hmm? So what do we do? Actually, it isn’t that difficult to stay on track during the holiday season. Go Potluck; Bring special dishes to family gatherings – gluten-free brownies, coconut “cheesecake,” coconut milk mashed potatoes, add potato starch to turkey gravy, wild rice stuffing, fresh cranberry sauce with apples and maple syrup, and more. Going “potluck” is a great way to go! Sip Slowly; When offered wine, drink half a glass over the evening and make certain that you drink water as well. It’s so important to stay hydrated. I, also, take some liver support at bedtime as I get a headache from drinking alcohol. Eat Prepared; If I know I’m attending a holiday event, I grab a bite to eat beforehand, so I don’t feel so famished and tempted to overeat. And while I am at the event, I can more easily choose the food that I know supports my health. Reinvent Family Favorites; By now, my family knows that I live a mostly Paleo lifestyle and my children have learned to cook some really healthy and delicious meals for our gatherings. They prepare some “old favorites” in new, more healthful ways. 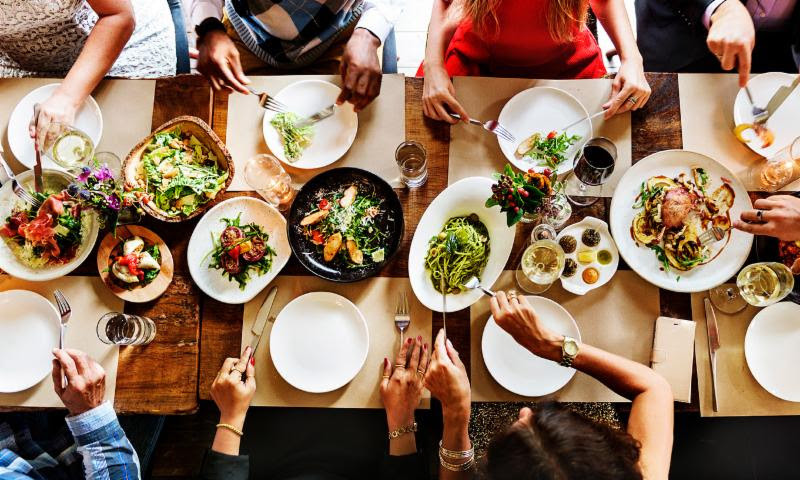 Eat in Moderation & Be Selective; If I am at a sit down dinner with friends and don’t have control of the menu or food offerings, I’ll eat a few bites and then enjoy anything else that makes me feel healthy and satisfied, UNLESS the food contains gluten and dairy (and then I politely pass). However, if there is nothing you can eat, then do your best to eat small bites. If exposed to gluten or dairy, then take some GlutenFlam for several days afterwards. I, also, take some Activated Charcoal for a couple of days. Finally, to maintain my “detox diet” as much as possible, I drink a ClearVite smoothie every day. But most of all, enjoy the company and don’t make the food the only reason that you are attending the gathering. By doing this you will maintain your emotional equilibrium and feel healthy throughout the season.